All children are badly behaved from time to time – it’s only natural, after all – but sometimes continued bad behaviour can be a sign of a more underlying behaviour problem. We explore some of the potential signs and signals to look out for if you’re concerned that your child could have a behaviour problem. No parent expects children to be angels all the time and children certainly aren’t. Children of all ages have times when they behave badly, or in ways that parents don’t expect. In young children, the ages two to three years are typically known as the ‘terrible two’s, as it’s a period when children are beginning to assert their independence, try and push themselves more and explore what they can and can’t, should and shouldn’t do. 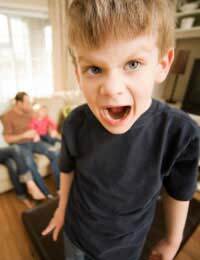 In older children, as they reach adolescence and become teenagers, a similar state of asserting independence can occur, with previously well behaved children transforming into rowdy or uncooperative teenagers. Both these stages of child development are an accepted and recognised stage and, in most cases, children will grow up and out of it with no unforeseen problems. When is Behaviour a Problem? However, at all ages and stages, sometimes other behaviour problems can develop and have a more deep-rooted cause. As a parent, or someone working with children, you may well be able to identify when a child’s behaviour is something more than an off day, playing up or being naughty. If a child is consistently behaving badly and behaving in irresponsible ways in a way that could be dangerous to their health and safety, or that of others, then it may be more than simply an off day. Ignoring all instructions and repeatedly doing their own thing. Not playing nicely with other children – kicking over building blocks, disrupting games and refusing to cooperate. Making a scene or having a tantrum in public places. Being argumentative all the time. Falling out with siblings over everything. Social interaction and emotional difficulties (not getting on with other children, never meeting eye contact etc) – as these can sometimes run hand-in-hand with some behavioural conditions. Some behaviour problems may be caused by changes going on in a child’s life, such as divorce or separation, the arrival of a new baby, getting used to becoming a step-family, moving house, the death of a family member or changing schools. Children can easily pick up on stress or anxiety going on around them, or become stressed themselves by major changes and new events. If you’re aware of any issues going on that could be affecting your child’s behaviour, then talking to them about the changes may help. There are also lots of good children’s books you can draw on for examples and reading them together may help a child realise they are not alone in their feelings or experiences. If you’re worried that your child’s behaviour could be more than a bad phase and can’t find any reason that could be triggering it, then it’s definitely a good idea to consult a healthcare professional. If your child is school age, then the school may be able to offer input too, especially if they’ve been experiencing problems at school. A parent’s instinct is important, so don’t ignore your gut feeling if you’re concerned there may be something more to it. If a health condition that affects behaviour is diagnosed, then at least there should be practical steps available, as well as medication, that may be able to significantly improve things for everyone concerned. So me as a kid think that most of the times when I'm mad it's because of the way my parent act I hate it when they yell. So than I get angry too, so I think thatbad behaviors varies to the parents.